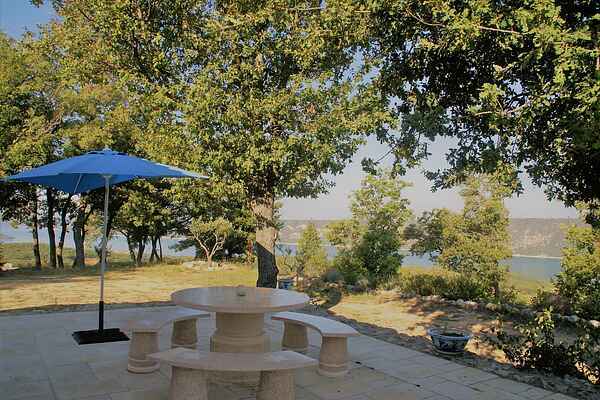 This villa was built in 2006 and has a spectacular view at the stunning lake of Sainte-Croix (a 1500m walk away) and a stone throw from the renowned Gorges du Verdon. This free-standing, single storey villa boasts a beautifully and carefully maintained interior. You'll have access to a multilevel garden and a spacious terrace outfitted with patio furniture, lounge chairs and a barbecue. Children can spend the day at play with the included boules games and tennis rackets. The lake of Sainte-Croix offers a variety of beaches, where you can rent paddle boats, swim, or surf to your heart's content. Pay a visit to the lovely waterfront villages of Salles-de-Verdon (11 km) and Saint Croix-de-Verdon (33 km). The breathtaking Gorges du Verdon is a local tourist attraction and is not to be missed. In the 21 km canyon, the emerald green waters of the Verdon River flow through steep cliffs, its banks spotted with secluded beaches. From Moustiers (15 km), you can begin a hike along the majestic canyon, that you can combine with many water sports or climbing activities. In the picturesque village of Aiguines, you'll find a carpentry museum, a chapel and a castle.